After surviving the "Deep Freeze of 2014" earlier this month, we've had to brace ourselves and our farm for yet another blast of frigid Arctic air. The temperature may not fall quite as far or remain below the freezing mark for as many consecutive hours as it did previously, but today's weather brought a menace the first hard freeze did not. I'm talking about that four-letter word that the mere mention of will send people rushing to their local grocery store to buy all the milk (a good thing!) and bread they possibly can. I'm talking about cloud dandruff, The White Death,...SNOW. As you can see in the photo to the right, snow drifts developed along the side of the county road between my house and the dairy barn. Driving conditions were treacherous, making my 0.6 mile commute seem like a 0.65 mile drive. 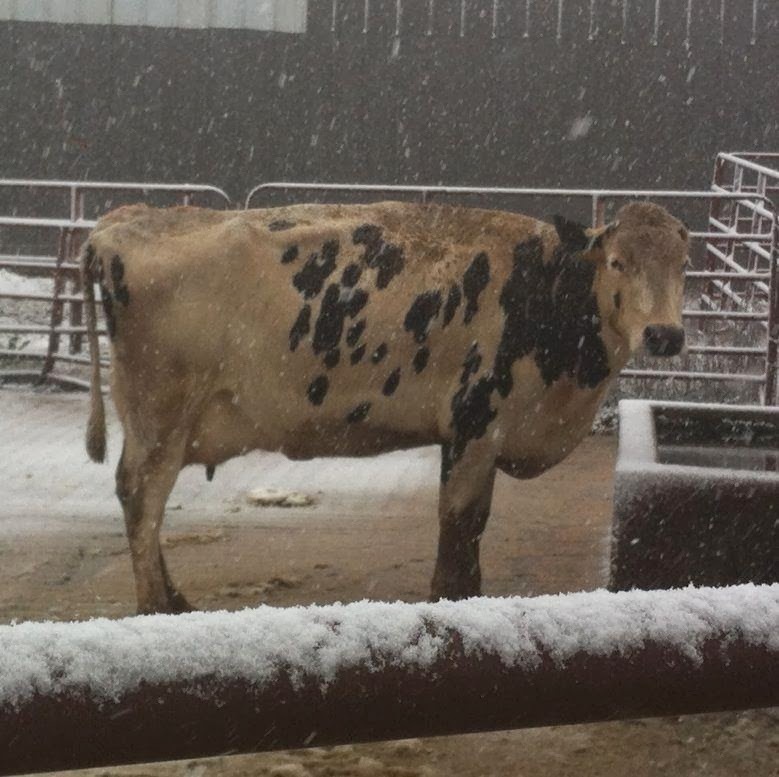 But despite all the problems caused by the snow and freezing weather, the cows had to be milked. And milk them we did. The cows didn't seem to mind the weather one bit. Save for a few slobbersickles (and one very impressive, four-inch long boogersickle), you would have never known by looking at them that it was a miserably cold day. Two or three small sheets of ice formed in the back of the milking barn prior to the cows' afternoon arrival, but they quickly melted. We did have one incident in which slow-moving traffic in the milking barn's outbound lane caused a significant back-up, but we did not attribute it to the same conditions that stranded thousands of motorists on Alabama highways today. "Slow traffic has caused a back-up in the outbound lane. Authorities say it is not weather related, just cows being cows." On a serious note, a "dusting" of snow might be an over-exaggeration of what we got this morning. The freezing temperatures have and will cause a few problems and delays around the farm, but the snowfall proved to be inconsequential in our area. But even if the "worst-case" winter weather scenario were to befall us, we would do whatever it takes to keep our cows fed, watered, and milked. That's the way it has to be, and that's the way it is! With the temperature expected to hit the 60° mark later today, I think it's safe to say we survived the "Deep Freeze of 2014". cows showing off their "slobbersickles"
As we expected, frozen water troughs and frozen milking equipment were the two major problems we addressed during the sixty-hour freeze from Sunday night through late Wednesday morning. Keeping fresh water available in our pastures proved not to be too terribly time-consuming, as busting and pitching out the surface ice in troughs once a day was generally sufficient. On the other hand, freezing milking equipment did put us behind the first three mornings of the week. Before we could milk our cows on a 7°F Tuesday morning (coldest temp since '96), Dad and I spent an hour thawing milk lines, pneumatic valves that power the equipment, and part of the vacuum system. Monday and Wednesday weren't quite as bad, each requiring only 30-45 minutes of pre-milking maintenance. I guess the most important thing through it all was that neither our cows nor we were ever in any danger of suffering cold-related health issues. Cows can handle temperatures well below 0° provided they have plenty to eat and drink, stay dry, and can get out of the wind, all of which ours did. And we were smart enough to wear plenty of layers and not stay out in the open for too long in cold we simply aren't used to. My fingers and toes got a little numb a few times, but far from anything serious. We are less than two weeks into January, so there is certainly time for another round of unusually frigid air to make it this far south. After working through what we did earlier this week, though, I don't have any doubt we can adjust our daily schedule and farm chores to successfully deal with it. The new year is finally here, and we're ringing in the first week of 2014 with 210+ cows in the milking herd, a pay-price of over $20 per hundredweight of milk, and cold, cold weather. I realize that "cold" in the Southeast isn't exactly what it is in other parts of the country (Minnesota, for example), but I've been wearing my long-johns just the same. We've had a little taste of freezing weather the last couple of days, but the really cold air is on its way and should arrive Sunday night. Once it gets here we won't see the mercury climb above 32° until Wednesday afternoon. The low point looks to be around 8° before sunrise on Tuesday...yikes! We've made it through longer periods of even colder weather before, and we'll get through the next few days too. The cows and heifers will be just fine as long as we provide them with water and haul hay for them to munch on, the milking equipment shouldn't take too long to thaw out, and we will be bundled up at least four layers deep. Still, I sure will be glad when Spring finally rolls around!